This is a later passage in McCliesh's letter to the London Committee from Albany Fort. 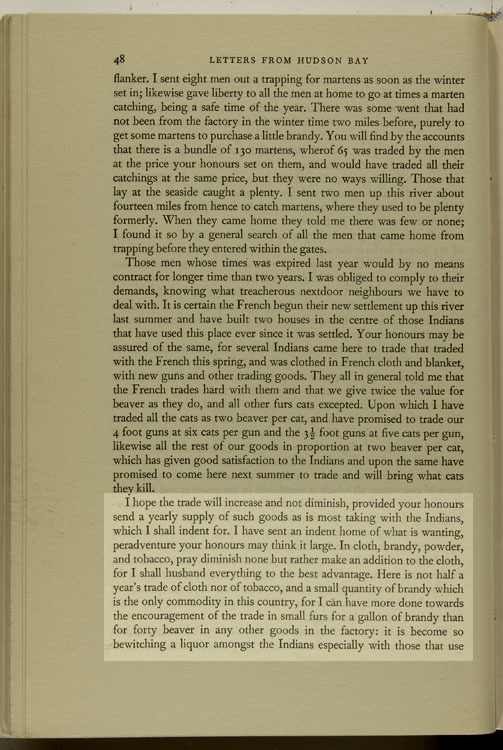 Here, he is advising the Committee on what kinds of trade goods will and will not be popular with Native traders, especially those who have been trading with a French trading post upriver. July 16, 1716, p48-49, 3rd pgh: "I hope the trade... in cats or martens." "I hope the trade will increase and not diminish, provided your honours send a yearly supply of such goods as is most taking with the Indians, which I shall indent for. I have sent an indent home of what is wanting, peradventure your honours may think it large. In cloth, brandy, powder, and tobacco, pray diminish none but rather make an addition to the cloth, for I shall husband everything to the best advantage. Here is not half a year's trade of cloth nor of tobacco, and a small quantity of brandy which is the only commodity in this country, for I can have more done towards the encouragement of the trade in small furs for a gallon of brandy than for forty beaver in any other goods in the factory: it is become so bewitching a liquor amongst the Indians especially with those that use the French. Where the French have settled up this river the Indians can come here in seven days from thence. Here is a large quantity of kettles in the country but so unusable that they never will be traded here; for it is impossible for Indians to carry them in their canoes nor draw them on their sledges through the woods in the winter, most of them being 15, 14, 13, and 12 lb., for no Indian will trade a larger kettle than 9 or 10 lb. at most, neither is there any profit to be got by them. The trade has altered to what it was formerly, for man, wife and children must be clothed in scarlet or purple, besides abundance of other finery, if they go with a hungry belly, for that an Indian cannot afford to trade a larger kettle. It is my opinion your honours had better send for them home whilst they are fit for sale, for in time they will spoil. Here is likewise a large quantity of plover shot which will not be traded nor spent in factory use in some years; for Bristol shot, duck, and beaver is the only shot that is useful to the Indians, likewise some great shot of which I have sufficient for two years, and of duck the same. I hope for the future your honours will send yearly such goods as shall be indented for both in quantity and quality, for now is the time to oblige the native: for if once we should be disappointed of goods I am positive that it will be a hard matter to draw the Indians from the French, for the French are a people that seldom spare for cost where a good bargain is to be purchased. I have had several complaints from the Indians of the badness of our cloth this year, and not without reason on their side, for the baize is as thick as it is; they matter not the fineness or the coarseness provided it is thick. All those Indians that has traded with the French, nay all the Indians in general, desire that they may have such short guns as the French trades, they being handy and light for travelling in the woods; they are 3 1/2 foot the longest and 3 foot the shortest. I have indented for some of the 3 1/2 foot and 3 foot; the 3 1/2 will go at nine beaver with most of the Indians, and the 3 foot will go at seven beaver in cats or martens." Read other accounts during this period of establishing early fort settlements and trade - enter 'Beale,' 'Kelsey,' 'Knight,' 'La Verendrye,' 'McCliesh,' 'Nixon,' 'Outlaw,' or 'Pinfold' in the search box to your left. Check the Beaver Index - e.g., enter 'Albany Fort,' 'trade goods,' or 'kettles,' etc. Read more about Thomas McCliesh in the Dictionary of Canadian Biography Online. Although the French had vacated the shores of Hudson Bay, French traders from Montreal and elsewhere in the St. Lawrence River valley could access the headwaters of rivers (like the Albany) that emptied into James Bay. Because of this French competition, McCliesh warned the Committee that he needed to offer the Natives better bargains than James Knight was offering at York Factory, beyond the reach of French traders. McCliesh also feared the possibility of an overland attack by the French: England and France were at peace, but that did not always prevent conflict between their colonies.